ClamCase is an American electronics company that creates keyboards designed to work with the Apple iPad Mini, iPad 2/3/4, iPad Air and iPad Air 2 tablets. With Big Apple Buddy’s personal shopping service, you can now buy direct from the ClamCase online store anytime, anywhere. 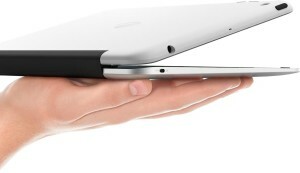 ClamCase makes different cases for each version of the iPad. When you easily snap on the ClamCase Pro to your iPad mini, you immediately transform your tablet into a laptop. This lightweight keyboard lets you get the most from your tablet while also maintaining its sleek design. You can clip the keyboard onto your tablet and use it as a laptop or as a kickstand, for when you only want to use the touchscreen feature of your device. The ClamCase pro gives you versatility and allows you to maximize your efficiency. The ClamCase Pro for the iPad Air 2 is a brand new design. Easily connect this keyboard to your device by using Bluetooth, and watch your tablet transform into a laptop. With this case, you don’t have to choose between the lightweight, easy to carry qualities of the iPad and the efficiency and ease of typing with a keyboard. Made of stunning aluminium, this case will fit right in with your tablet and make it look like one seamless device. Unfortunately, the USA ClamCase online store does not currently offer international shipping. However, Big Apple Buddy, your personal shopper, can help you buy products direct from the official USA ClamCase online store and ship them to your doorstep, no matter where you are in the world. If you would like to buy from the USA ClamCase online store, simply let us know which items you would like to order (by filling out the form below) and we’ll get back to you with a free international shipping quote within 24 hours!